It takes superior genetics and proper feeding management for a dairy buffalo to be able to unleash its full dairy potential. Put another way, the animal’s capacity for high milk yield is a result of its feed intake as much as its genetic attributes. Thus, it is imperative in every dairy production enterprise that there is an abundant source of feeds for the animal, such as forages, to ensure a copious flow of milk, experts from the Philippine Carabao Center (PCC) said. Over the years, the number of small-hold dairy buffalo production units in the country has increased as the PCC continuously implements its intensified Carabao Development Program (CDP). The CDP aims to harness the potential of the native carabaos as dairy animals by improving their breeds to provide a viable additional source of income to the Filipino farmers. The PCC’s efforts have resulted in an increase of the population of high-quality milking animals in the hands of rural dairy farmers throughout the country. With this development, however, the dairy farmers, who are also mostly rice farmers, are challenged by the pressing need to provide enough and proper food for the animals to ensure higher milk yields. In a survey conducted by the agency among leaders of the different dairy cooperatives in Nueva Ecija, one of the major problems that surfaced was the lack of enough feed to meet the requirement of the animals. The survey was meant to assess feed-related aspects of livestock production. The same issue was also identified during a separate dairy forum. The problem, it was pointed out, is exacerbated by the reluctance of some farmers to devote a part of their land as forage area. This limitation prevents farmers from expanding their herd size and hinders them from providing the right amount of feeds for their dairy buffaloes, thereby not reaching optimized milking capacity of their animals and in effect, an optimized income. To address the problem, the PCC has taken steps to improve and scale up local forage production in the country. “We need to help farmers establish their own pasture areas and plant improved grasses and legumes,” Dr. Arnel N. del Barrio, PCC executive director, said. The PCC is putting in place a national forage program through the establishment of forage nurseries across the PCC network and in the different regional impact zones. “The national nursery will contain different forages that will be acquired from various sources. These will be tested and evaluated according to their yield and compositions,” del Barrio said. The PCC regional centers, he added, will also develop their own nurseries with tested forages taken from the national nursery. The extent of their nurseries for forage growing will vary depending on the suitability of the materials given the environmental conditions in their respective regions. When the institutional nurseries are developed, smaller ones will be established at the cooperative level to be managed by the farmers and will be accessed by them for a certain fee. “These nurseries will ensure the continuous propagation of high quality grasses and legumes and the availability of planting materials for our farmers,” the PCC head stated. After ensuring the availability of planting materials, the next step would be the promotion of the utilization of the improved grasses to the farmers. An expert will be hired to spearhead the development and implementation of tools or modalities on how to effectively transfer the forage technology to the farmers, he explained. With the availability of planting materials and an efficient tool in cascading the technology, it is assured that the farmers will be able to provide quality feed for their animals, he added. Aside from fresh forages, the PCC is also pushing for the use of complementary feeding materials for the dairy buffalo, especially during the lean months for forage production. Currently, it is collaborating with the Philippine Council for Agriculture, Aquatic, and Natural Resources Research and Development (PCAARRD) in several projects to produce sustainable supply of conserved forages for feeding of the dairy buffaloes. One such project is the community-based production and marketing of silage. A group of farmers in Lupao, Nueva Ecija is engaged in the project, promoting and marketing silage as a nutritive feed for the dairy buffaloes while demonstrating its potential as a viable source of income for farmers. Another project is the use of urea-treated rice straw (UTRS), an enriched rice straw, as another feed resource for buffaloes. 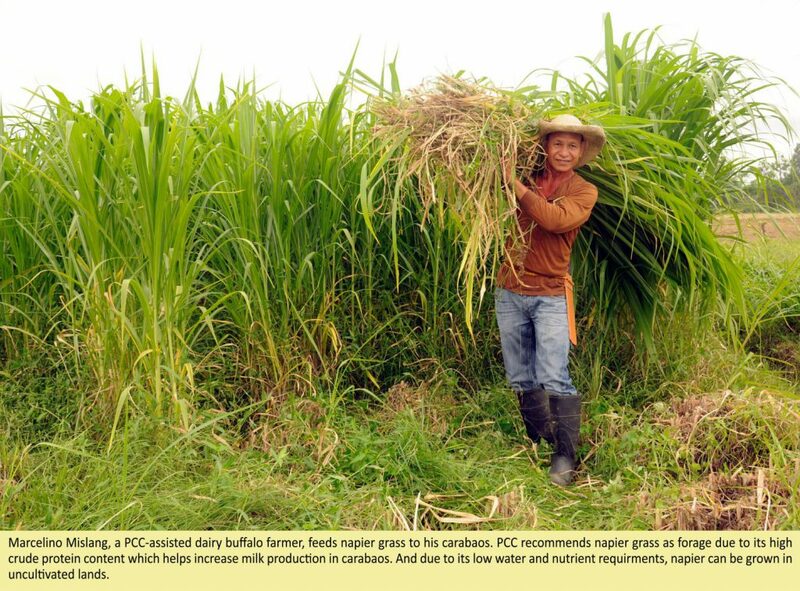 According to Dr. Daniel L. Aquino, project leader and head of PCC’s animal nutrition unit, the treatment of rice straw with urea and/or molasses increases its crude protein content. The improvement in its nutritive value leads to the enhancement of its palatability and digestibility, thus, helps increase the feed intake and the overall productivity of the buffaloes, he added. The project is currently piloted among selected farmer-cooperatives in Llanera and General Natividad, Nueva Ecija. The PCC is conducting various researches to further develop technologies that will help improve the nutritional aspect of dairy buffalo production. The Animal Nutrition Unit is currently studying the composition of Pakchong, an improved variety of napier grass, and studying its utilization aspect as feed for the dairy buffaloes. Developed in Thailand, the Pakchong is being touted as the “super napier grass” due to its high yield and high crude protein content. It also grows faster and taller than the native grass. The grass is being propagated and planting materials will be distributed among the dairy farmers, PCC officials said. Meanwhile, the team is studying the use of bypass fat as feed supplement to supply the needed energy of a lactating carabao, enhancing its ability to produce more milk. Another study geared towards optimizing the milking potential of dairy buffaloes is the use of feed microbial to improve the overall functions of the rumen, thereby increasing the animals’ feed nutrient utilization. As the PCC continues to make headway in its multi-pronged efforts, it is always conscious of its mandate to use the carabao as a tool in the betterment of the lives of local dairy farmers. All its efforts are directed at providing and creating a sustainable livelihood to usher in socio-economic development to their lives. “The bottom line will always be how to best help the dairy farmers,” del Barrio said.